Are Butterflies Attracted to Color? 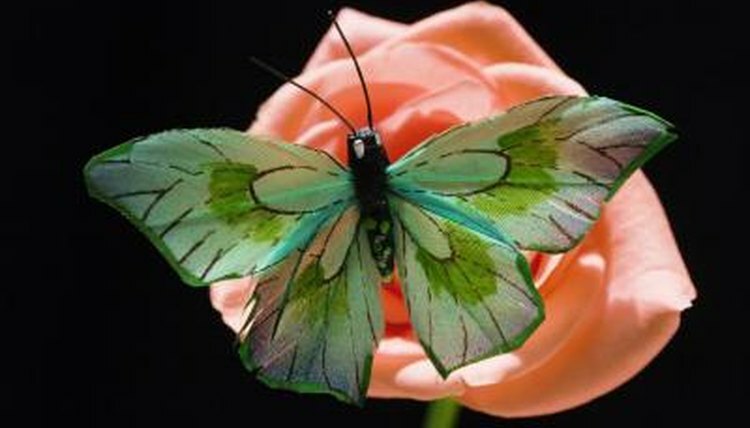 Butterflies are attracted to the bright colors of many kinds of flowers because of the nectar found in them. Planting these flowers -- in conjunction with a few other measures -- can help you attract numerous butterflies to your garden. Butterflies are drawn to brightly colored, fragrant flowers because of the sweet nectar they provide. They are especially drawn to red, yellow, pink, orange and purple. To attract butterflies to your garden, group many flowers of the same or similar colors together instead of mixing together many different colored flowers. Flowers with flat heads provide excellent landing pads for butterflies to sit on while they soak up sun and drink nectar. In addition to brightly colored flowers, female butterflies seek out plants that make good hosts for their larvae. Caterpillars live on these hosts plants, which serve as their primary food source until they become adults. Monarch caterpillars, for example, feed solely on milkweed, whereas black swallowtails develop on parsley and dill plants. Group the larva plants together just as you do with the flowers. Male butterflies are attracted to and congregate around wet areas such as wet sand or mud puddles near ponds. They get needed minerals from these areas. To attract butterflies to your garden it's important to consider this aspect of raising your garden. You can create your own damp puddle area by digging a 2- to 3-inch hole in the soil about 24 inches wide in a area that is often watered, such as by a bird bath or near a hose runoff. Attract butterflies by creating an environment that is similar to what they would have in the wild. Butterflies congregate in open areas that have lots of sunlight. They also like areas that have shelter from high winds. To achieve this, keep tall, wild grasses and wind-breaking plants around the garden. Also, make sure your garden is in an area that gets at least six hours of sunlight a day. Sunlight is critical for the butterflies, who bask in its rays with their wings spread open to get the most absorption. Brian McCracken lives in Portland, Ore., where he writes on pets and animal wildlife as well as a wide array of other topics, ranging from real estate to personal development. What Kinds of Lettuce Do Walking Sticks Prefer? Are There Lightning Bugs in Texas?